Experience the hospitality of America’s largest home with a package at our relaxed, comfortable Village Hotel. 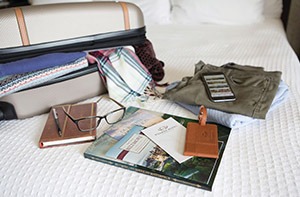 Our packages transform your stay into a curated experience with unique dining and entertaining options. Your getaway at Village Hotel combines a charming cottage feel with views of farm fields, and delicious dining and amenities that make your stay memorable and relaxing. Imagine a cozy mountain retreat situated in the heart of a charming, lively little village. Featuring décor reminiscent of turn-of-the-century farmhouses and cottages, your comfortable room is just steps away from delightful dining, shopping, and outdoor activity options, and an award-winning winery. Come experience the kind of relaxation our Village Hotel inspires when you make it your home away from home. Call to Reserve. Biltmore House admission is not included with this package. Please purchase admission when making your hotel reservations. *Subject to applicable tax, gratuities, and availability. Extend your experience of our new exhibition with a stay in the heart of charming Antler Hill Village. After imagining yourself a cherished houseguest at a lively turn-of-the-century Vanderbilt House Party, enjoy the gracious hospitality to which the Vanderbilts treated their guests. Maximum four-night stay. Subject to applicable tax, gratuities, and availability. Blackout dates may apply. Gather family and friends for a relaxing summertime stay that allows you to re-connect with nature, explore Biltmore’s farm life, and enjoy acres of gardens and trails at your own pace. As day transitions to night, return to our Village Hotel, conveniently located in the heart of charming Antler Hill Village & Winery. Enhance your stay with additional outdoor activities and tours—see our full list here. *Rates are based on double occupancy and subject to applicable tax and availability. Gratuities are not included. Package applicable up to a four-night stay. Blackout dates include July 25, July 26, August 3, August 6, August 9, and August 10, 2019. Spend this Christmas Eve in the heart of charming Antler Hill Village and wake up on George Vanderbilt’s magnificent estate Christmas morning. Village Hotel on Biltmore Estate offers a perfect combination of comfort and convenience where you and your family can enjoy gracious hospitality, festive décor, estate-raised fare, and so much more. Experience the traditions of Christmas at Biltmore and create the kind of holiday memories that last a lifetime. 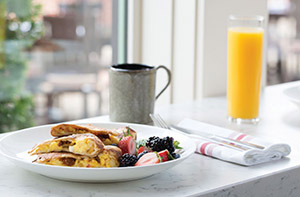 Breakfast daily at Village Social; peak breakfast visitation 9 – 10:30 a.m.
Special Offer: Extend your stay by arriving early December 20 – 22 or staying through December 26 and receive $50 off per night on the additional nights. Additional nights include accommodations and Breakfast daily at Village Social. *Subject to applicable tax and availability. Requires a minimum two-night stay. Does not include Candlelight Christmas Evening visit of Biltmore House. Guests may make reservations for Candlelight Christmas Evening visit for December 23 for an additional $25.